There are at present over 300 known species of sharks with more being discovered every year. The mega mouth shark was first discovered in 1976, when one was caught off the coast of Hawaii. It was found entangled in the anchor of a ship. Since that time there have been 47 mega mouths caught and positively identified. The largest of all sharks is the whale shark. They can grow to be fifty feet in length and are the largest fish in the ocean. These giant creatures eat plankton and there has never been a recorded incident of anyone being harmed by these enormous fish. The fastest shark in the ocean is the Blue shark. The smallest sharks are the dwarf lantern fish. A fully grown female will reach 7 to 8 inches in length, males will reach a top length of 7 inches. Shark finning is practiced throughout the world. Shark finning is the practice of capturing and then cutting off a shark’s fins. This is often done while the fish is still alive and then it is tossed back into the sea to become food for other fish. Shark meat has little or no value. In both the Fiji and the Solomon Islands it is forbidden to eat the meat of a shark. Fisherman, therefore simply throw the bodies overboard once they have the fins. Sharks do not have bones. Their entire skeleton is formed of cartilage. Rays share this trait with the shark. More than 100 species of sharks are on the verge of extinction. The three main reasons for this trend are, over fishing for their fins and cartilage, destruction of habitat and finally, bybeing caught by large fishing boats in nets and long line fishing. 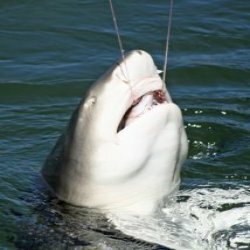 The notorious great white is on the endangered list. Shark skin is so rough and abrasive that in the past it has been used as sand paper. Today, shark skin is being used as a leather replacement. You can find shark skin belts, purses, wallets etc. Sharks are continuously growing new teeth. Sharks will produce a new set of teeth about once every two weeks but there is some variances between species. Older great whites will only grow replacement teeth every 200 days. Shark teeth have been used in various cultures as weapons. Sharks have a very acute sense of smell. In a million drops of water they can smell one drop of blood. This entry was posted in Animal Trivia and tagged Shark, shark facts, shark information facts, Shark information trivia, Shark Trivia, sharks by Jane. Bookmark the permalink.